As we all know only too well, Japanese cuisine is some of the ruddy best on the whole planet. But did you know that there are countless examples of regional specialities all over the country? This year, Japan Centre is bringing the best of Chugoku Region to you lucky kids in the UK! Read on for more info. 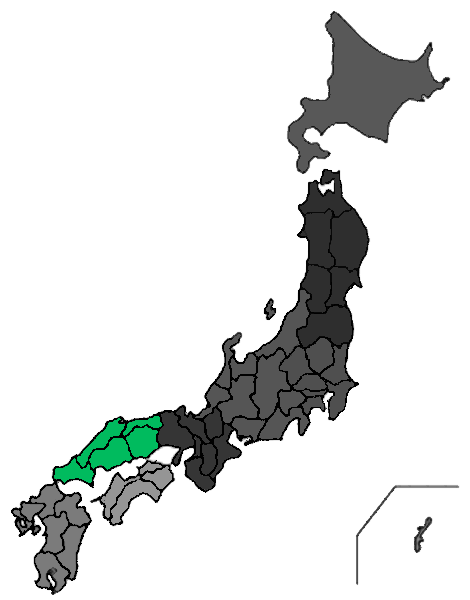 Helpfully illuminated in green here, Chugoku is a region in West Honshu that encompasses the prefectures of Hiroshima, Okayama, Shimane, Tottori and Yamaguchi. This is a multifaceted area with a rich history, varied landscape and some totally tasty local cuisine, including one of our absolute faves at Japan Centre – Hiroshima style Okonomiyaki. Not only will we be supplying these rare and colourful goodies from Chugoku in store and online – we’ll also be giving out free samples in our Piccadilly store. It’ll be a right royal food festival! Keep your eyes peeled for more info in the coming weeks. Japan Centre – Japanese Food Hall Since 1976. Posted in Food, Tea and tagged Hiroshima, JAFF, Japanese Food Fair, Tottori. Bookmark the permalink. Setsubun – Rid Your Demons… With Soy Beans!